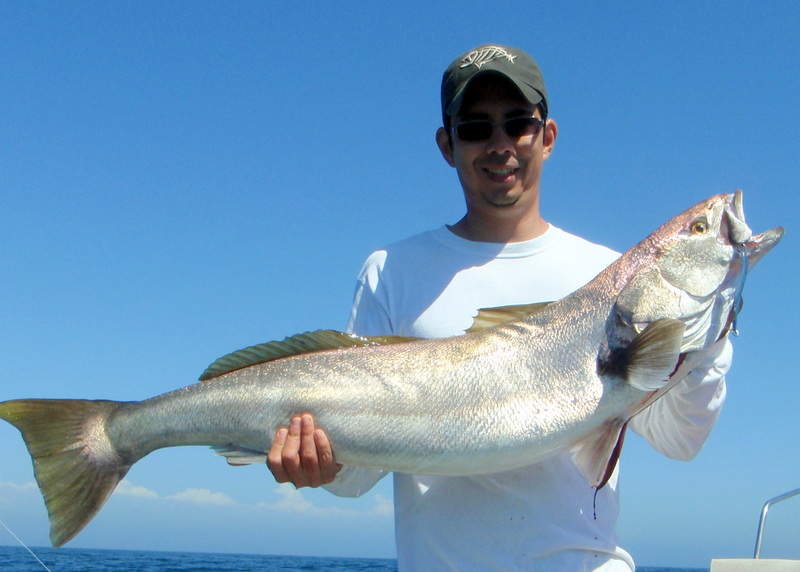 White Seabass are probably the most prized inshore fish in Southern California. They are also a mysterious fish, usually biting only for a short time when certain conditions line up. Thanks to stocking programs they have made a tremendous comeback after nearly being fished out like their cousins the Totoaba in Mexico. They are usually caught in kelp beds near shore and at some of the Southern California islands such as Catalina and San Clemente and the Channel Islands. 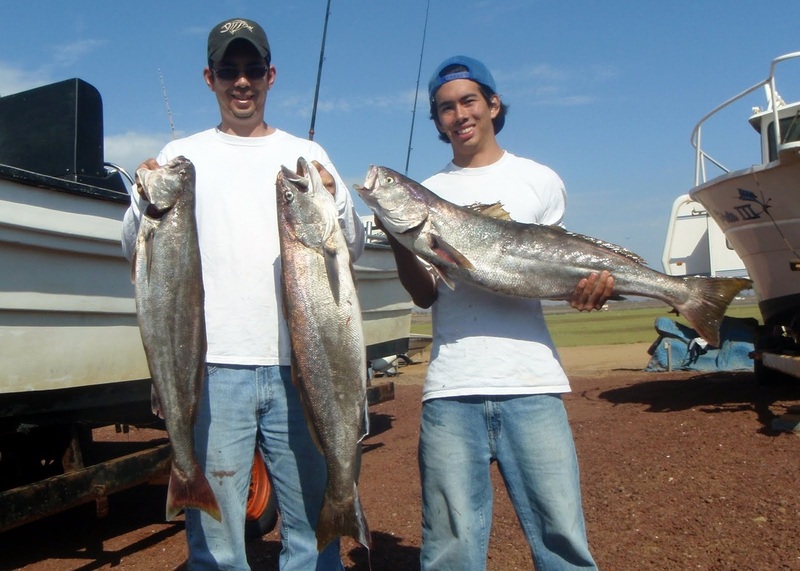 There is also a healthy population to be found in Northern Baja. 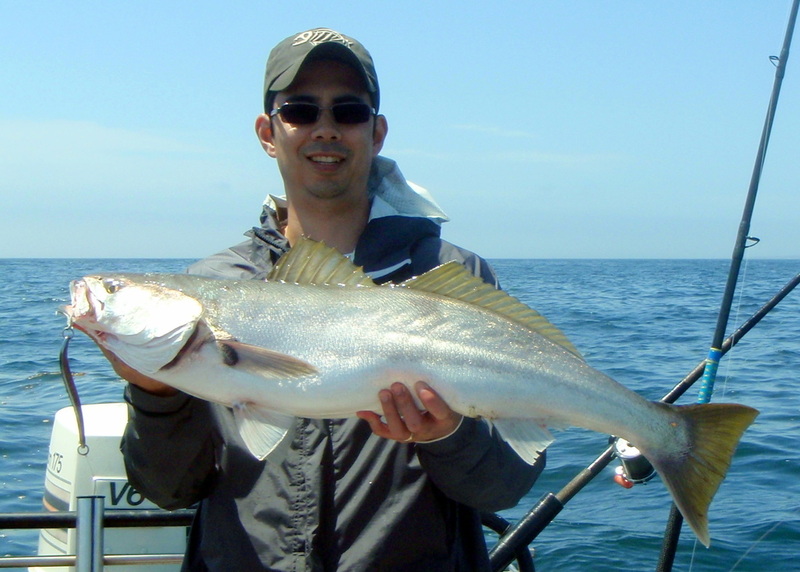 White Seabass can be very frustrating to chase most of the time, but other times they go on feeding binges where they wolf down baits and lures with abandon. This is one of those fish that you could spend a lifetime trying to figure out. They put up a decent fight and taste delicious. 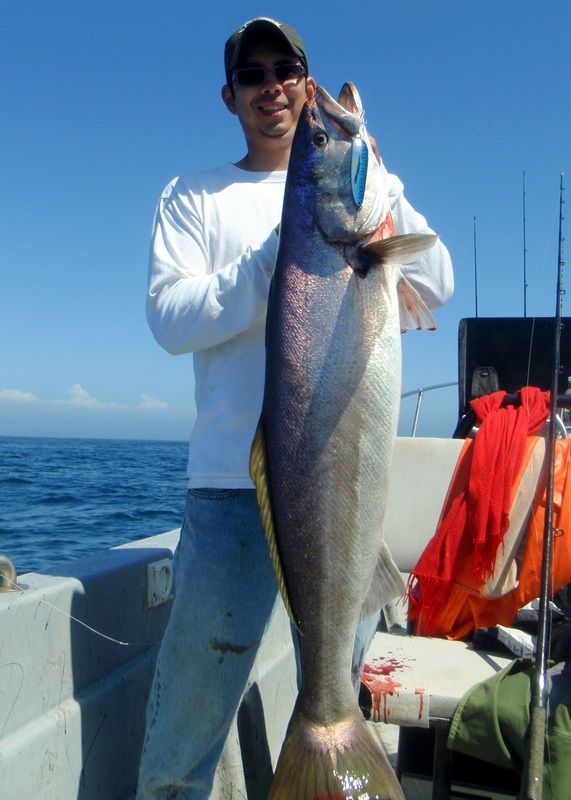 They are a hefty inshore fish, attaining a max weight of around 75lbs. The fish in the picture above was caught within casting distance of shore. I usually use a medium weight baitcasting or conventional saltwater setup. 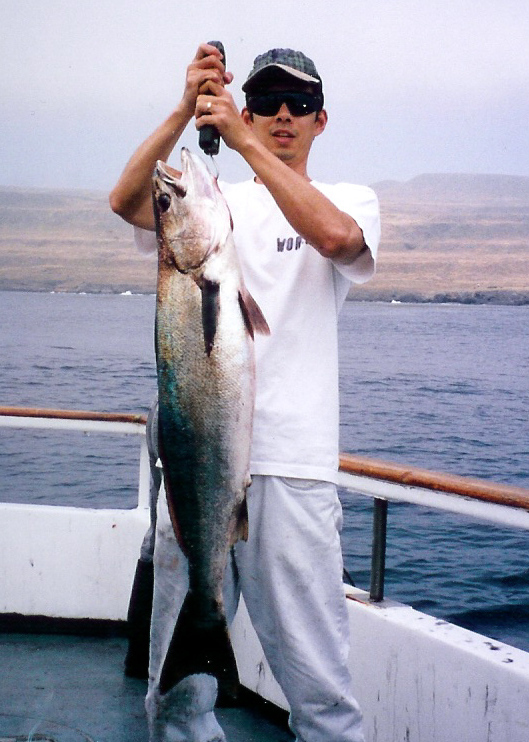 White Seabass have soft mouths and so you cannot crank down the drag too hard or you will lose some. 20-30lb test line is good; you can go heavier if you are fishing at night. An Accurate BX 400 or similar conventional reel will work well, and you can also tackle them with quality spinning gear such as a Daiwa Saltiga reel. Pair the reel with a good Calstar rod with a soft tip and you are ready to fish. These fish can be tricky to find. Sometimes, often early in the morning, they come in very close to the beach. My largest one to date, a 47lber, was caught within 100 feet of shore. I have seen some 40-60lbers cruising right off the beach at Catalina. Other times they are found in the kelp lines farther out and other times they go who knows where. When the squid are around the seabass are usually not far off. When they are feeding on Pacific Mackerel, particularly in Baja, they can often be found by looking for birds diving on bait that is driven up by the fish. 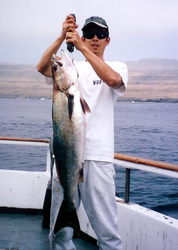 All of my lure-caught White Seabass have been caught on large Krocodile spoons in silver or mackerel color. I just cast out to where bait is breaking and let it sink below the bait and then start a straight steady retrieve. However, that technique is much more popular in Baja than in So Cal and I have never tried it or seen it tried in Southern California. 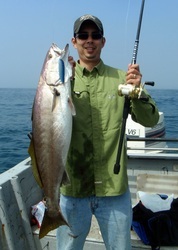 Most So Cal White Seabass are caught on bait. Sometimes they bite a white jig, which people usually tip with a whole squid or two. The number one bait by far in Southern California is live squid. Number two would be fresh dead squid. They are fished either pinned on a jighead or on a dropper loop off the bottom. Depending on where the fish are you might want to suspend them under a bobber. 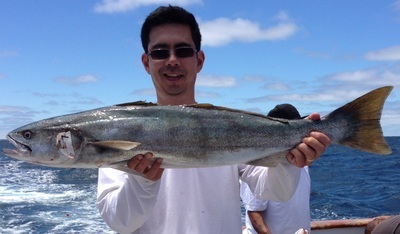 Sometimes they are also caught using live Pacific Mackerel up here, and that is the number one bait in Baja. I generally fly line the mackerel with no weight. Another good trick is to cast a Krocodile spoon where there are mackeral, hook one, and then just leave it out there swimming around with the spoon until a White Seabass wolfs it down. When I target big seabass I go to San Quintin, Baja. I usually go three days before the full moon in August, September, or October depending on whether the fish have been reported. They are very sensitive to moon phase. I personally would not go any other time although obviously they eat at other times as well. You can also target them with some success in Spring and early Summer in Southern California, especially if the squid are around. An overnight trip to Catalina Island or San Clemente Island can pay off big if you hit the conditions right. Ronnie Kovach's book Saltwater Fishing in California has some great information.